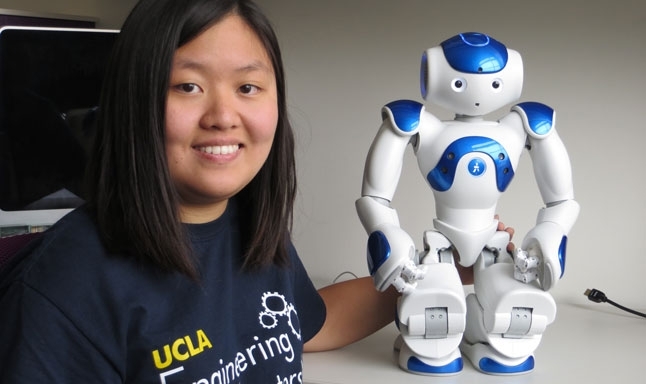 Sunnie So, an undergraduate researcher with UCLA Engineering, poses with a robot that can serve as a medical companion for elderly people recovering from injury or illness. Most adults would prefer to age in place—that is, remain in their homes as long as possible. Too often, that doesn’t happen. Although the AARP reports that 90 percent of adults over the age of 65 would prefer to stay in their current residences as they age, the rising risk of illness and injury often puts that desire beyond many people’s grasp. Doctors from the David Geffen School of Medicine at UCLA and engineers from the UCLA Henry Samueli School of Engineering and Applied Science may have found a solution. They’re collaborating on an effort that could allow people to recover in their homes after injuries and hospitalizations despite the need for greater health monitoring. Together, these experts from different fields are developing a cohesive system that uses wireless smart watches, state-of-the-art motion sensors, air monitors and even a robot that can serve as a medical companion and aid in such recuperative activities as exercise. Working together, engineers, computer scientists, clinicians, biomedical researchers and information technologists have formed the UCLA Center for Systematic, Measurable, Actionable, Resilient and Technology-driven Health, or Center for SMART Health. This multidisciplinary team is developing and testing health care devices and systems to address challenges in the way health care is delivered to the elderly, while also decreasing emergency room visits and hospital readmissions. The center’s first project, called the SMART Home Lab, is a mock residence on the UCLA campus where researchers can simulate the responses of theoretical patients, monitor their recovery and assess their physical activity, such as how long patients linger in bed or how much time it takes them to navigate across a room. That information is transmitted to a smart watch, is privacy encrypted, and is then sent to a server and saved, providing an accurate picture of what these imaginary patients are doing while at home. The next step is to assess the system using real patients. The sensors will be tested in 300 L.A. area homes later this year as part of a research study. 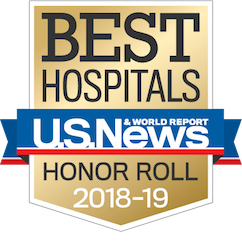 Eventually, if proven successful, these sensors could be routinely installed in patient homes to help them get healthy and avoid long stays at skilled nursing facilities. Upcoming projects from the center, based at the Geffen School of Medicine, will focus on diagnostic and treatment technologies. The center’s co-directors are Dr. Arash Naeim, an associate professor of medicine and school’s chief medical officer for clinical research, and Majid Sarrafzadeh, a distinguished professor of computer science and electrical engineering at UCLA Engineering, and a co-founder of the UCLA Wireless Health Institute. Naeim, who also is an associate director of the Clinical and Translational Science Institute at UCLA, said the new effort will be strengthened by cooperation between the schools. But the biggest beneficiaries will be the patients. “One of our goals is to determine the best way to monitor elderly, frail patients who are undergoing treatment for an illness or recovering from a hospital admission, and to ensure they are able to stay independent and living in their homes for as long as possible,” Naeim said.